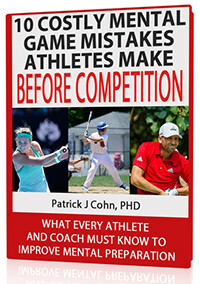 Mental Training Expert Dr. Patrick Cohn has been an athlete and a coach. He has experienced firsthand how beliefs, attitudes, and mindsets influence performance. Dr. Cohn’s passion for sports and sports psychology started early in life and continued to grow as he participated in sports such as football, hockey, baseball, lacrosse, racquetball, and golf. Today, largely based on Dr. Cohn’s research and work with high level athletes, experts in the field of sports psychology consider him to be the leading authority on pre-performance routines and mental skills for entering the zone. He is the president and founder of Peak Performance Sports, LLC in Orlando, Florida, where he provides mental toughness training to individual and team athletes. In the midst of all these activities, mental game expert Dr. Cohn has still found the time to author CD and workbook programs, such as his best-selling series, The Confident Athlete CD Series and The Confident Sports Kid CD Series. If you need an expert’s answer for your mental game question, Dr. Cohn would be happy to answer you via email: Contact Dr. Cohn today!